Crafted to complement the decor of virtually any small dining space with mid-century flair, this five-piece dining set comes with four chairs and a round dining table. The chairs are curved to conveniently tuck right under the table. Constructed from sturdy rubberwood, the set is available in walnut and black faux leather or grey and grey linen to suit your dining room decor. 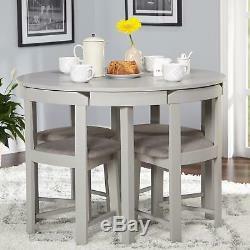 Includes round dining table and four chairs. Chairs tuck under the edge of table. MDF, rubberwood, and veneer construction. Walnut or grey finish options. Black faux leather or grey linen upholstery options. Seat is 17.5 inches high x 16.5 inches wide x 15.8 inches deep. Chair is 28.75 inches high x 16.5 inches wide x 16.5 inches deep. Table is 29.6 inches high x 41.3 inches wide x 41.3 inches deep. Please note: Some options listed or pictured may be currently out of stock. All in-stock options are listed near the Add to Cart button. The digital images we display have the most accurate color possible. However, due to differences in computer monitors, we cannot be responsible for variations in color between the actual product and your screen. The item "5 Piece Dining Table Set Grey Wood Kitchen Room 4 Chairs Compact Round Furniture" is in sale since Saturday, March 3, 2018. This item is in the category "Home & Garden\Furniture\Dining Sets". The seller is "modernhomedecor" and is located in Southfield, MI.